Low-cost airline Ryanair is to open a new base at Southend Airport next April. The Essex hub will be the point of departure to eight countries on 16 routes, including Barcelona, Corfu, Milan and Venice. One million Ryanair passengers a year are likely to pass through the airport on more than 55 flights a week, with trains running between London Liverpool Street and the terminal. 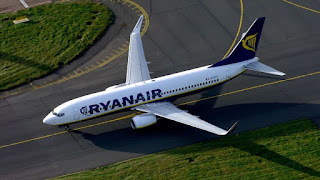 Southend will be Ryanair's 14th base, creating 750 on-site jobs according to the carrier, in what its chief commercial officer called a "vote of confidence in UK aviation". "Ryanair guests travelling to and from London and the Essex area can now enjoy low fares on a choice of 13 routes through London Southend's exceptionally passenger-friendly terminal," Mr O'Brien said. The news follows warnings the airline planned a pivot away from the UK thanks to Brexit, and news that just 10% of Ryanair's growth will be in the UK this year, compared to 25% in Germany. Ryanair will close its Glasgow base at the end of the summer, and demand for flights to the UK and Europe is reportedly flat this year. Passenger numbers from countries including Germany, Italy and Spain, however, are growing. The owner and operator of London Southend, Stobart group, has been rocked by its own turmoil in recent weeks as key shareholders attempt to remove boss Iain Ferguson in favour of Phillip Day.